First on the kit, it is high quality - I have the angel eyes which have been problematic particularly if run with the HIDs. I left my options open when installing the kit by drilling an additional hole in the stock reflector for those wires and the high beam solenoid so I can use the original high beam and parking light bulb holes. 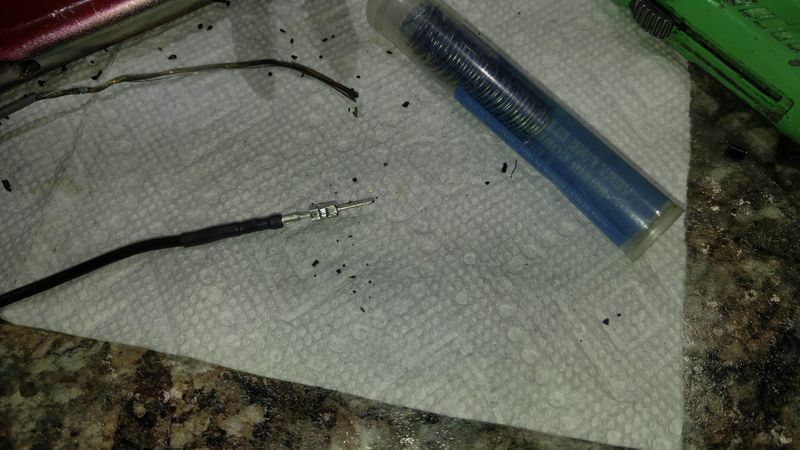 There is plenty on line regarding removing the lens and installing the kit available on Fred's post. 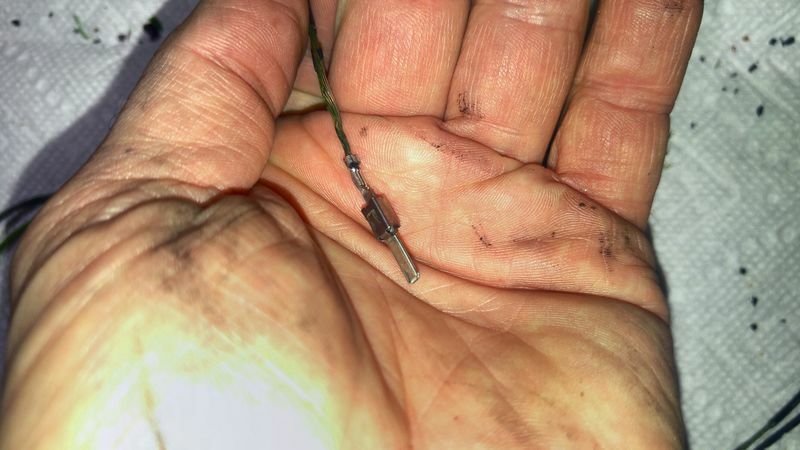 What is not available is a guide to rebuilding the light wiring harness. 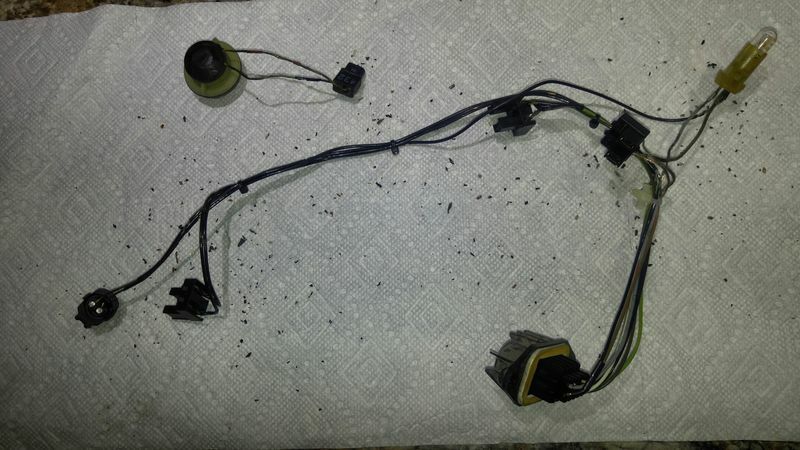 to start with, if you live in the south as I do, you can expect the electrical insulation on the wires in your headlights to be rotted away. The flakes on the paper towel fell off the wires as they were handled. Note the bare wires. The entire harness has to be rebuilt. To do this solder, wire and a few tools are needed. You'll end up with this - note there is no insulation left on the wire, it simply fell off. 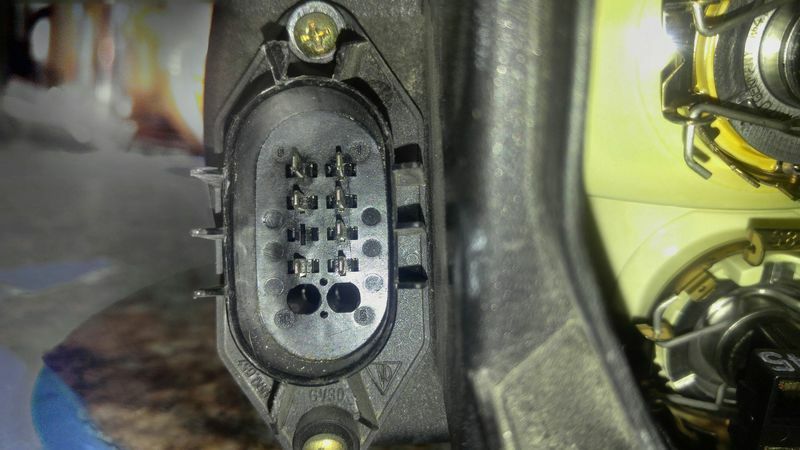 About 1/8 to 5/32 inch of wire is needed on the connector or between wires to be spliced. Interleave the strands of the wires to be spliced. Here I have 2 wires interleaved with one. The next photo shows a pin with the next step after interleaving the wires. 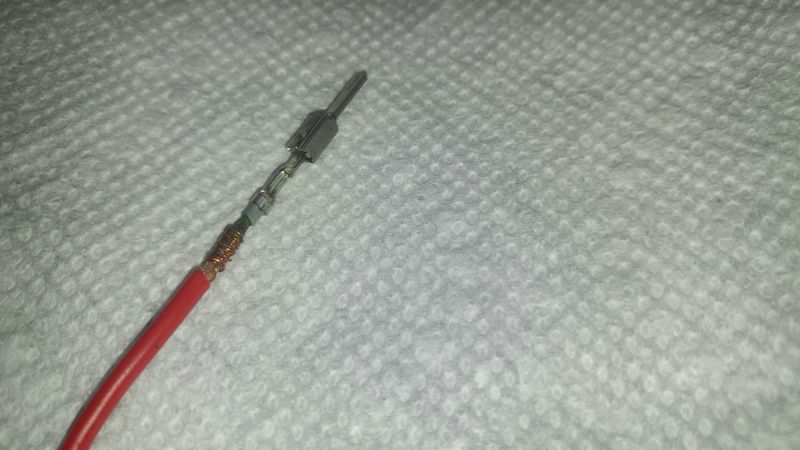 Solder the spliced joint by heating the wires with a soldering tip and touching the tip and heated wire with the solder, it will flow into the wire. You'll need to flip the wire do the same to the other side. Rebuilding the harness one wire at a time helps to avoid mixing up the wires. 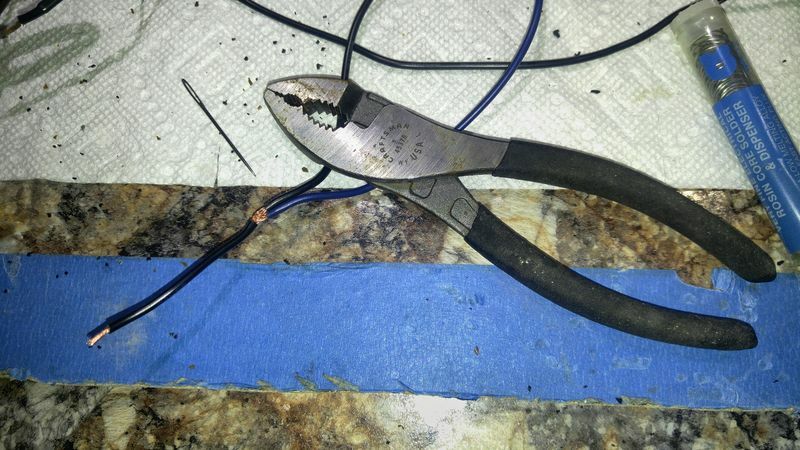 Measure the length of the new wire against the one being replaced. Photo documenting the harness is also very helpful in putting it back together correctly. 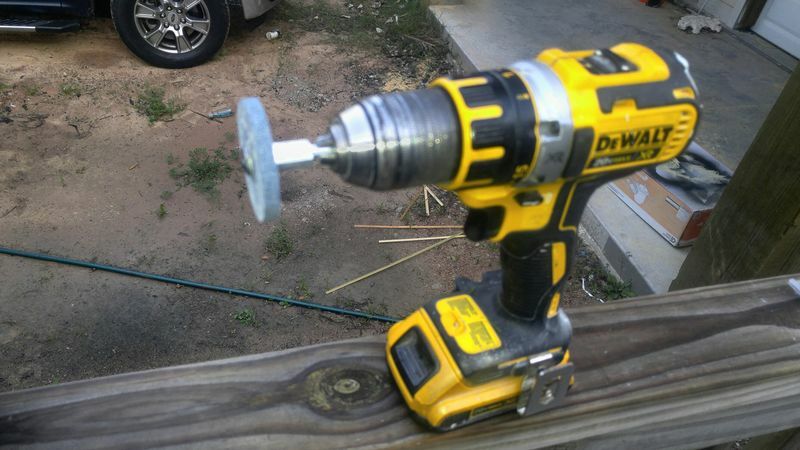 It's easy to mix up pins if more than one is removed at a time. 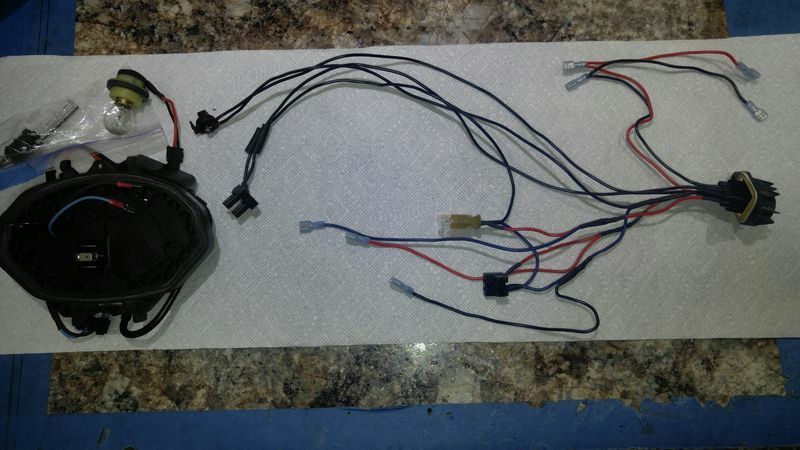 You end up with a new harness after going through this process - it will be modified from the OEM to take into account Fred's kit, and to add PWs relay to turn off the angel eyes when the headlights are on. After that its a matter of stuffing the new harness into the light assembly. I'd show a shot of new wiring installed in the light, note the blue and white wires coming out of the new hole in the reflector, but I'mout of photo's, so thats it unless someone has a question. Location: Agoura Hills (LA) So.Cal. Nice write up. I look forward to seeing your progress. I'm looking at doing this myself. Where did you get the kit from? No problem, very nice, high quality kit. The installation was way easier than I thought it would be. 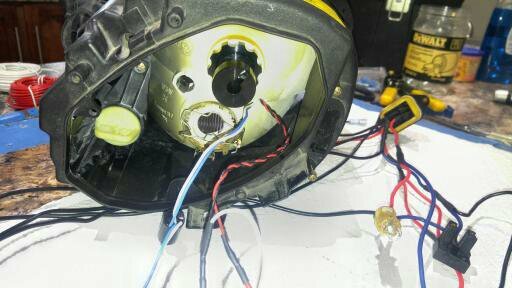 Here is a pic of the back of the light with the angel eye and high beam solenoid wiring running through an additional hole drilled into the reflector. That way the original running light (now a 6K LED - looks GREAT!) can be used behind the HID housing. The original high beam is also available. 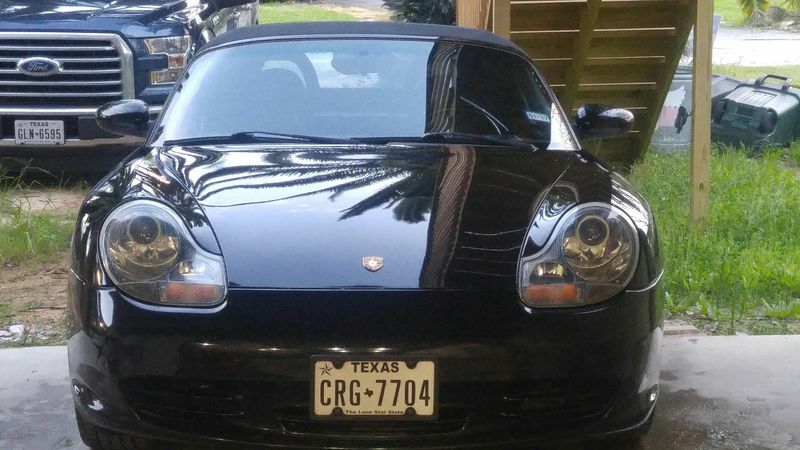 The picture reflections, the car's dark/paint color, the Texas plate... everything. I'm glad my crappy video was of some use (I never was much of a showman). That looks great. Where did you get the kit? My headlights have burn marks inside, and the halogens aren't cutting it. 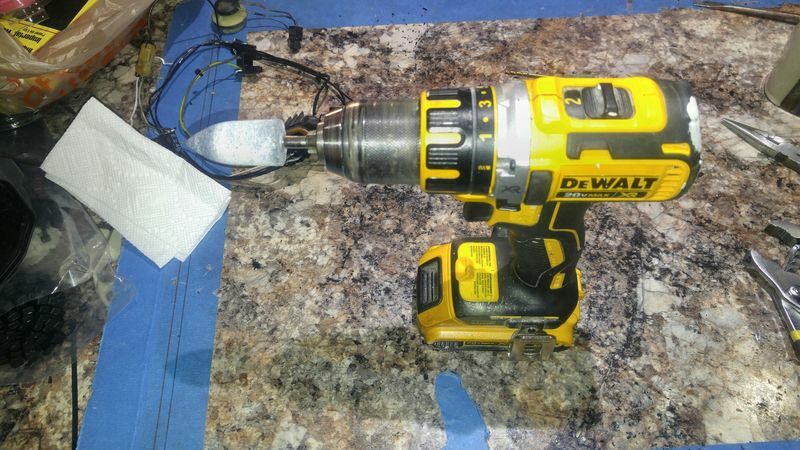 You get them right here on the forum in this DIY section - Look for the Nine8six post on prototyping headlights. These are metal, not plastic. Very important if you're not into roasting marshmallows over your hood.